A Sunday afternoon, the weather outside looks like Wailord cast Rain Dance and you decide to build your new pokemon deck. You sit down to look at your collection. The first question that a lot players ask themeselves is what type of deck do I want to build? Selecting a type of Pokemon can be a good base. Often times certain types of pokemon have abilities and attacks that work well together. Grass Pokemon can heal, fire Pokemon use up a lot of energy etc. etc. This mindset, building a deck based around type, can be restrictive. The type of Pokemon you're using and the attacks they have will determine the amount and the type of energy you will include. Other than this it really doesn't matter what Pokemon you choose to play. Granted the more of a single type of Pokemon you have the better the odds are that when you draw an energy it will be the right kind. Another way to build and personally the way that I prefer, is to find a single card that you really enjoy. Pick a favorite Pokemon or even a Pokemon with an attack that you find interesting. For me it is Electrode Prime. Hands down one of my favorite cards in the format and playable in a variety of decks. Almost any deck benfits from energy excel. Looking at a specific card and what would work well with it can spark interesting stratedgy ideas. Finding that strategy in pokemon of the same type isn't a bad starting point but don't forget other types might have Pokemon with attacks or abilites that can help strengthen your deck. Finally, you don't have to count on using every pokemon as an attacker. 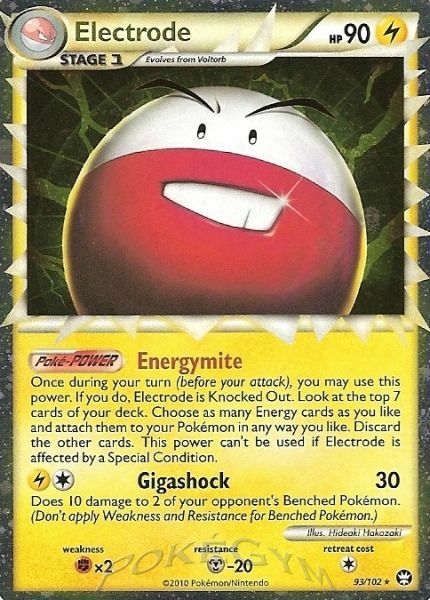 I would run Electrode Prime in decks that ran zero electric energy. Playing a pokemon to only sit on your bench isn't an unreasonable play. Building a deck, like building a VGC team, requires variety and a lot of testing. Don't be afraid to break out of your type or try a new evolution line. In the comments tell me some of your favorite cards, new or old. I'm curious about what you like to play?